One of the many dessert options at Cape May Cafe's buffet is the Oreo bon bons. It's great for anyone who likes chocolate or Oreo cookies and it's one of the desserts at the buffet. Prepare the mousse: Melt chocolate. Whip 16 oz. heavy cream until consistency of ice cream. Place gelatin in cold water. Heat egg yolks until warm; add chocolate, stirring constantly. Place gelatin in microwave until gelatin is dissolved. While gelatin is heating, add one third of heavy cream to the egg yolk and white chocolate mixture; mix well. Add a little of the cream to the heated gelatin and mix well, then add both the gelatin mixture and the chocolate mixture to the remaining whipped cream and fold until incorporated. Fold in crumbled cookies, mixing well. Let mousse set up, around 2-4 hours. Prepare the ganache - Over light heat, melt 16 oz. chocolate into 16 oz. of heavy cream, mixing until combined. Place 3 dozen Oreo cookies on a sheet pan. 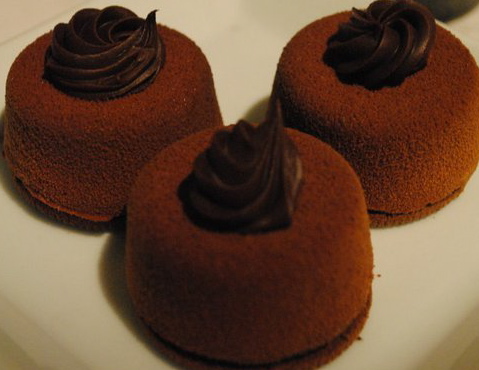 Pipe mousse onto cookies, and dip into ganache. Those look delightful!! I think that I may have to try it out myself!! I had these last night at Chef Mickeys. Delicious.